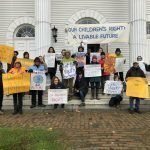 The teachers were protesting against the freeze of their wages while they were negotiating new contracts with the Transitional School Committee as a result of the school district merger involving Williamstown Elementary, Lanesborough Elementary and Mount Greylock Regional schools. The teachers refused to run any extra programming beyond classroom instruction, including clubs and tutoring. As a result, students from the College were unable to start jobs and volunteer positions through the Center for Learning in Action (CLiA) at the Greylock schools. Now that the job action has ended, CLiA is reconnecting with the schools in the district. CLiA Associate Director and Director of Elementary Outreach Jennifer Swoap expressed excitement regarding this development. “We are happy the job action is over and we can resume Williams’ partnership activities with Mount Greylock Regional School District,” she said. Opportunities such as tutoring and classroom help are now available at Williamstown Elementary and Mount Greylock Middle and High School. For the first time in several years, the Williamstown Select Board considered an application from a nonprofit hoping to receive taxpayer funds from the town. The request, which originally arose last year, is from the Sand Springs Recreation Center (SSRC), which operates a public swimming pool in the town. The Select Board is eligible to disburse funds to nonprofits under the Community Preservation Act, which generally applies to groups that use the money for a specific, one-time purpose. The SSRC’s request, however, is for general support with operation expenses, leading some on the Select Board to worry that it would encourage additional nonprofits to apply for similar grants, thereby flooding the system. However, in a May town hall meeting, community members expressed strong support for the SSRC’s request. In response, Williamstown residents Susan Stetson Clarke and Michael Sussman, as well as Professor of Economics Stephen Sheppard, have worked together to create a tightened application form for the fiscal year 2020, creating a strengthened standard for future nonprofits. On Sep. 24, the Select Board examined the proposal; later in the fall, the Finance Committee is expected to provide additional feedback. The new application will ask about current assets, a list of officers and the ways the proposed funds would concretely benefit residents of the town. This is an attempt to distance these nonprofit applicants from those who apply under the distinct Community Preservation Act. Future applications will be due on Jan. 15, 2019, pending Select Board and Finance Committee approval. In 1988, Dr. James E. Hansen testified before Congress that the southeastern and midwestern sections of the United States would be subjected to high temperatures and drought in the near future. Thirty years later, climate change is still a major problem, and citizens are still using the legal system to advocate against the issue.